A prosthetic heart valve is surgically implanted in the heart to replace a heart valve that has become damaged due to heart valve disease. Heart valve replacement surgery is performed when repair of the valve is not an option. The heart has four valves: the tricuspid (tri-CUSS-pid), pulmonary (PULL-mun-ary), mitral (MI-trul), and aortic (ay-OR-tik) valve. Each valve has a tissue flap that opens and closes with every heartbeat. The function of the flap is to ensure that blood flows in the right direction – through the four chambers of the heart — and to the rest of the body. Stenosis occurs if the flaps of a valve thicken or fuse together. The heart valve is unable to fully open and blood flow through the valve is restricted. Regurgitation or backflow occurs as a result of a prolapsed valve. Also known as a leaky valve, a prolapse occurs when the valve bulges back into a heart chamber during a heartbeat. A prolapse mainly affects the mitral valve. Atresia occurs if the heart valve does not have an opening for blood to pass through. Heart valve disease can be either congenital (before birth) or it can develop over time or be the result of an infection. At times, the cause of heart valve disease is unknown. Congenital heart valve disease can occur on its own or with other congenital heart defects. Most often congenital heart valve disease affects the aortic or pulmonary valve. Acquired heart valve disease usually affects the mitral or aortic valves. Rheumatic fever is usually caused by an untreated bacterial infection. Complications may not appear until much later in life. Endocarditis is a bacterial infection that affects the heart valves causing growths, holes, and scarring in the valves. During valve replacement surgery, the damaged or faulty valve is replaced with a biologically compatible or mechanical valve that is sewn into the annulus of the native valve. Biological valves may last 10 to 15 years or longer and are made from pig, cow or human heart tissue. 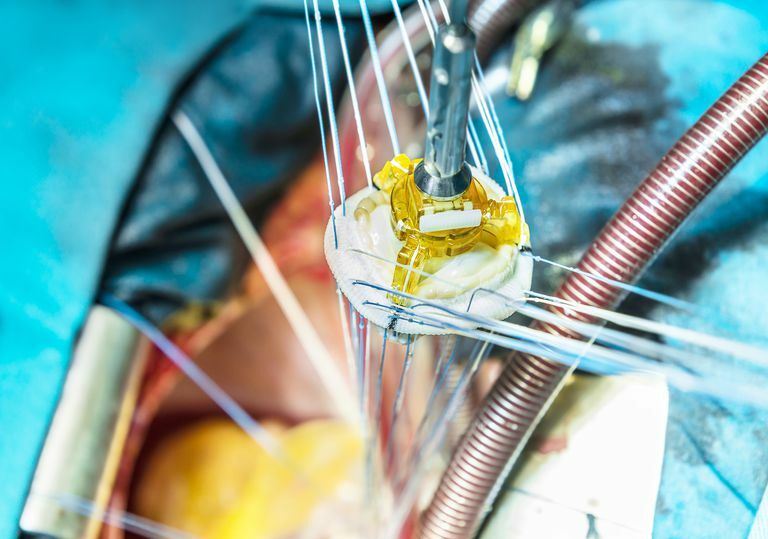 Mechanical valves last longer and do not have to be replaced but patients will need to take blood-thinning medication for the rest of their life to prevent blood clots from forming on the valve.